In the census of 1871, Henry and Harriet Thompson were the proud parents of four young children, Harry aged 4, George aged 3, Ernest aged 2 and baby new-born Aubrey. They lived in Princess Street Cambridge, in the parish of St Andrew the Less. They may have married in 1863 or 1866 because when I check the marriage records there are two grooms called Henry Thompson who get wed in Cambridge, one to Harriet E Ingrey, one to Harriet Beasley. How do I find which is the Harriet I want, the mother of Harry, George, Ernest and baby Aubrey? 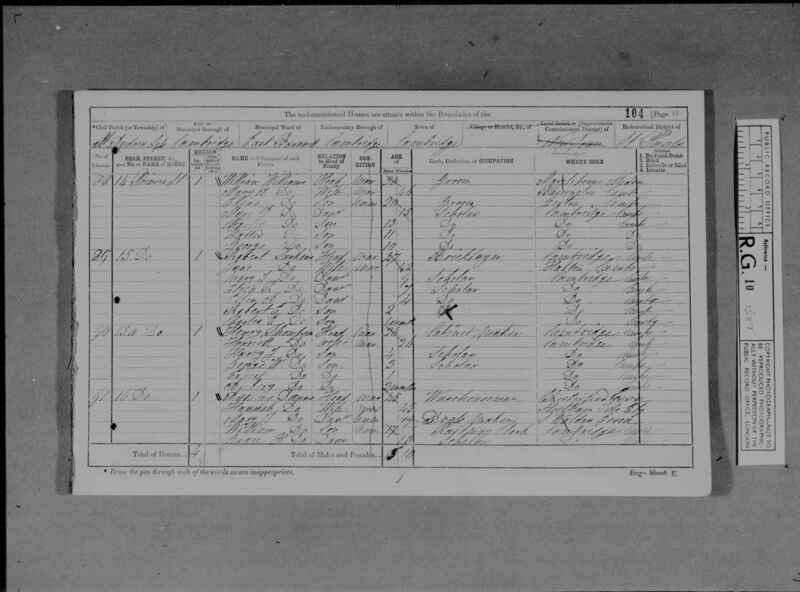 I know from the 1871 census that Harriet was born in 1845… which may not be correct as people did tend to lose track of their ages, but it’s a starting point! I’m going to check the two Harriets’ births… be right back! I’m back.. and my first trawl through the birth records have not been much help, no Harriet Ingrey, but five Harriet Beasleys born between 1840-1850, none in Cambridgeshire… which does not necessarily mean anything, people moved about a great deal more than we usually suppose. So let’s check again. Still no joy so I’ve moved to the 1881 census and both Henry and Harriet have changed their birth date to 1843; I know it’s the same family because of the same names of children, including the unusual Aubrey (the only other Aubrey Thompson in the census was born in India) Harriet again states she was born in Cambridge so I’m pretty sure that must be so. They have moved now to Convent Garden, no not the famous one, this one is in Cambridge in the same parish of St Andrew the Less. Henry is a cabinet-maker; his eldest son, no longer Harry but Henry is a domestic servant, the rest of the children are at school or home. There are more children in the family, a little girl, Amy Harriet born in 1874, baby Charles just a year old, and tiny Barnabas. There has been sadness though, because at around the time Amy was born, little Ernest died aged just five. Another son was born in 1878 and he was named for his brother, Ernest Frank. Still on the hunt for Harriet’s maiden name I have moved onto the 1891 census. Now her date of birth is 1843, her husband 1842. There are more children at their new residence in 45, Perowne Street; George, Amy Harriet, William and Barnabas are still at home although George was working as a paper hanger… another mysterious Victorian occupation. Was he decorating houses? Working at the newspaper press, putting up advertisements on hoardings? William is an errand boy but the other children are still at school, Margery, Winifred and Ernest, and baby Helen is at home. The little children are 8, 6, 5 and 1. There seems an error, Ernest should be 13, not 5… but tragedy has struck again and the second child named Ernest died at the age of 3. How very heartbreaking, and how anxious they must have been for their third child called Ernest.. 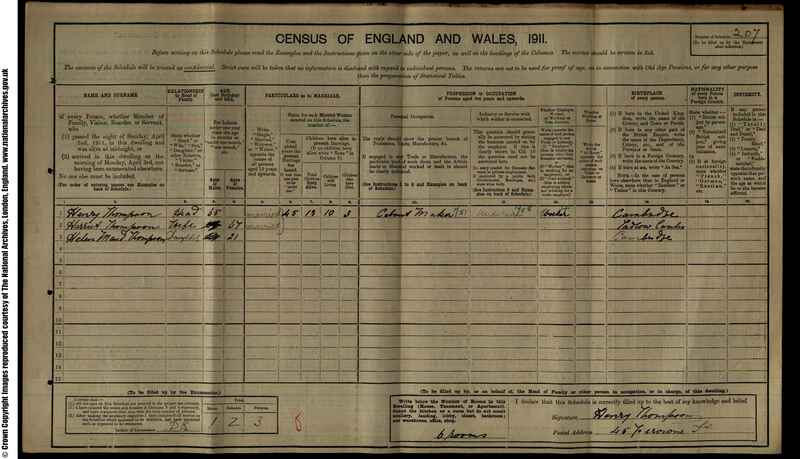 I keep looking at the records, extracting more and more information; Henry is a cabinet-maker, he spent most of his life as a cabinet-maker… it is only in the 1911 census that the record reveals he worked for an undertaker… making coffins. One new piece of information I have from the census of 1901, Harriet was born in Tadlow, a village to the south of Cambridge. There were Ingreys in Tadlow but no Beasleys… so I have come to the conclusion that Harriet was born an Ingrey, probably in 1843 give or take a year, and she died a Thompson nearly seventy years later, in Cambridge in 1913. She had at least fourteen children, one of whom was my godmother Daphne’s mother. So my detective work with the census material and the birth, deaths and marriage records, have shown me a little glimpse into one family’s story.